Managing agricultural waste continues to be one of the key challenges in the agriculture sector. It continues to accumulate as more crops are being grown to produce food for the growing population. Agricultural waste could be an untapped biomass resource that can ease the country’s environmental burden or source of profit if converted into new and valuable products. This was the challenge posted by Department of Agriculture (DA) Secretary Emmanuel Piñol to the onion industry, specifically the research and development (R&D) sector. “What we want to do is to make our onion farmers more competitive so that they can produce more even at current operating costs so that they can earn more,” Secretary Piñol said. To do this, the agriculture chief mentioned strategies such as adopting new farming technologies and techniques to lower production costs and increase farm yields of the local onion farmers. Upon posting this challenge, DA has embarked on various initiatives to protect the country’s onion industry. Specifically for the Bureau of Agricultural Research (BAR), the national R&D arm of DA, it was tasked to spearhead research initiatives on how to make the most out of onion leaves that are usually considered waste materials after the harvest season. “[They will] study if it could be dehydrated and used in arroz caldo, mami and as spice in Oriental dishes,” Secretary Piñol instructed. Onion (Allium cepa) is an important crop which is highly-valued for its flavor, nutrients, and medicinal properties. No dish will ever taste the same without that distinct flavor and aroma of onion. In 2016, the Philippines ranked 70th among the 150 countries in the world production of producing 122,595 tons of onions. China, India and Egypt are the top three producing countries (FAO Statistical Database, 2016). In the Philippines, Nueva Ecija continues to be the top producer of onion accounting to at least more than half of the country’s production. The onion varieties commonly planted are red onion, yellow or white onion, and shallot. The Philippines’ onion exports, mainly consisting of the red shallot type, are mostly coming from Nueva Ecija. Onions are harvested manually by pulling the matured bulbs. After harvesting the bulbs, the onion roots and leaves become waste. Due to lack of proper disposal of organic waste, the accumulation of large quantity of organic wastes has become a challenge. The onion leaves are left behind in the field and are allowed to decay producing foul odor and a repository for pests and insects causing possible contamination and environmental hazard in the area. Seeing the value from these agricultural wastes, particularly the onion leaves, Secretary Piñol instructed BAR to look into the possibilities of finding new uses or converting new products from these waste onion leaves. Specifically, he instructed that the onion leaves, upon dehydration, be used as spice in Oriental dishes, including arroz caldo and mami. By doing so, farmers will be able to earn more and address the problem of managing farm wastes. In response to the directives of Secretary Piñol to explore research interventions that can optimize the uses of onion, BAR met with project implementers from various R&D implementing agencies, including the University of the Philippines Los Baños (UPLB), during the last quarter of 2017. The meeting was set to come up with an integrated program that will cover various researchable areas and the development of technologies on onion. 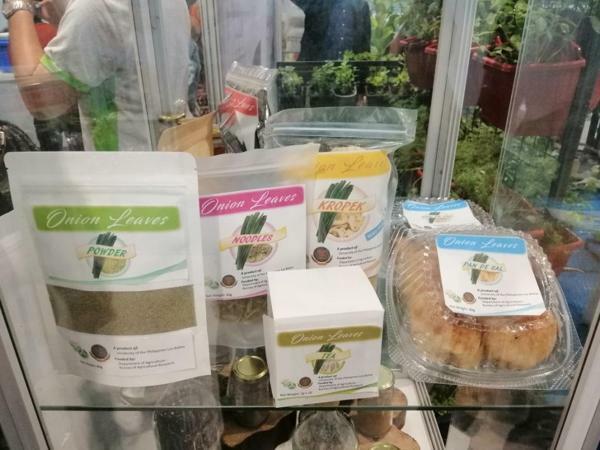 Implemented in 2017, UPLB’s project titled, “Increasing Farmers’ Income through the Utilization of Waste Onion Leaves for Various Applications” aimed to develop package of technologies (POTs) for the utilization of onion leaves into different products, and to promote the commercialization of POTs to provide additional income to farmers. Dr. Myra G. Borines, project leader from UPLB, mentioned that one of the potential impacts of this research initiative is to produce high-value products from waste onion leaves, thereby increasing the profit of onion farmers. She added that with this study, there will be a reduction of postharvest losses, and increase competitiveness of onion industry. According to Dr. Borines, similar to spring onion, onion leaves may have the same components that can be processed for food applications. With proper research and processing technique, onion leaves can be used as spice in local dishes. One of the challenges that the group of Dr. Borines must addressed was the pesticide residues or traces present in the onion leaves. Onion’s vulnerability to a wide range of pests has resulted to the use of chemical pesticide by onion growers. Prior to the processing of onion leaves for food application, the samples were analyzed for residual pesticides and various methods to remove the residues were explored. Among the methods used to remove pesticide residues include: washing with tap water, soaking in 1% vinegar solution, boiling, washing with 0.02% liquid detergent solution, and soaking in baking soda and lemon juice. These methods were based on the study of Dr. Susan May F. Calumpang of the National Crop Protection Center of the College of Agriculture and Food Science (CAFS), University of the Philippines Los Baños on the removal of pesticide residues in vegetables. Storability studies were also conducted to determine as to what extent the leaves can be stored. “Different factors affecting the shelf-life of onion leaves will also be considered. Characterization and monitoring of the bioactive components of onion leaves has to be done to investigate the different potential products from its utilization,” explained Dr. Borines. In the study, various dehydration (drying) techniques were explored to enhance the shelf-life of onion leaves. Dehydration is the process of removing water or moisture from a food product. Dr. Borines explored four dehydration techniques for this study. These include: 1) sun drying (cheapest and simplest method), 2) conventional drying (air is heated with steam, gas or hot water and then circulated over the wet product), 3) freeze drying (involves the sublimation process, where solid turns into gas without becoming a liquid), and 4) vacuum drying (involves indirect heating generally used for heat-sensitive materials). Initial results of the study showed that conventional drying and vacuum drying were the preferred methods in preserving total phenolic content (TPC) and total flavonoid content (TFC) of onion leaves. TPC and TFC are the phytochemicals present in onion leaves. In terms of color and appearance, onion leaves were best preserved using freeze drying. Likewise, desired significant reduction of moisture in onion leaves was achieved using this drying technique. As for the products developed from onion leaves, the group of Dr. Borines was able to produce at least five POTs. These were: 1) dried onion leaves (can be further processed as tea); 2) powdered onion leaves (can be further processed as seasoning/salt, kropek, noodles, pandesal); 3) pickled onion leaves; 4) onion leaves extract (can be further processed as puree and juice); and 5) vacuum-fried onion leaves (can be further processed as garnish).